Calibri is a modern sans-serif typeface created by Lucas de Goot and published by Ascender, but ultimately owned by Microsoft. Containing flat rounded & corners, small caps and some useful numeral sets, Calibri is hugely readable in both small and big text and it has multi-purpose usage. Calibri is so awesome! 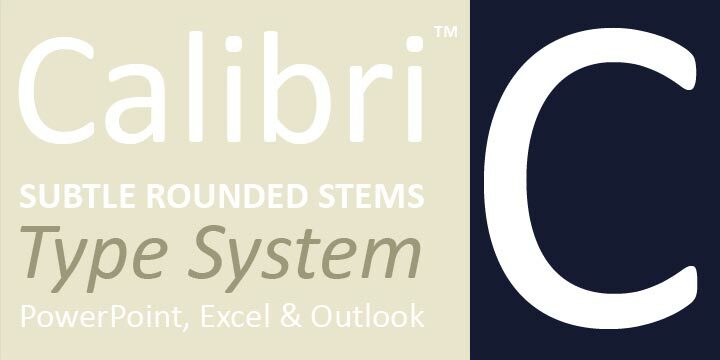 Note: Calibri is a trademark of Microsoft Corporation registered in the U.S. Patent & Trademark Office and may be registered in other jurisdictions. A font description published on Tuesday, December 16th, 2014 in Ascender Corp, Fonts, Lucas de Goot by Alexandra that has 3,592 views.